Rene, his twin sister, Renate, and their German-Jewish parents lived in Prague. 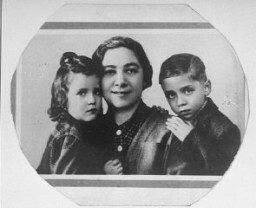 Shortly before the twins were born, Rene's parents had fled Dresden, Germany, to escape the Nazi government's policies against Jews. Before leaving Germany to live in Czechoslovakia, Rene's father, Herbert, had worked in the import-export business. His mother, Ita, was an accountant. 1933-39: Rene's family lived in a six-story apartment building along the #22 trolley line in Prague. A long, steep flight of stairs led up to their apartment, where Rene and his sister, Renate, shared a crib in their parents' bedroom; a terrace overlooked the yard outside. Rene and Renate wore matching outfits and were always well-dressed. Their days were often spent playing in a nearby park. In March 1939 the German army occupied Prague. 1940-45: Just before Rene turned 6, his family was deported to Auschwitz from the Theresienstadt ghetto. His arm was tattooed with the number 169061. There, he was separated from his sister and mother and put into a barracks with older boys--many seemed to be twins. Rene didn't understand what was going on. Sometimes he was taken to a hospital, even though he wasn't sick, and was measured everywhere and X-rayed. Once, Rene and other boys watched when Soviet and Polish soldiers were shot into a pit outside. Rene and his sister survived and were reunited in America in 1950. They learned that as one pair of the "Mengele Twins," they had been used for medical experiments.